Boys can learn a lot by starting and running a business. 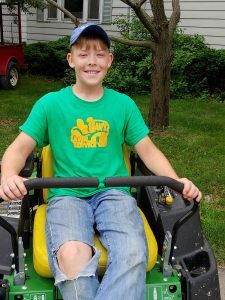 Jen’s youngest son, Sam, bought his older brother’s lawn business two years ago, when the older brother moved to Tennessee (where he has since started another lawn care service). At age 12, Sam has a roster of 18 clients. He cuts and trims lawns and performs most of the necessary maintenance on his machines. In this very special episode, Sam shares the story of his business, as well as some tips for would-be entrepreneurs and their parents. This episode is a great one to share with your boys!